IITA and the Job Creation Unit (JCU) under the Office of the Vice President of Nigeria are exploring areas of possible collaboration with a view to creating jobs for youth in the country. At a meeting in IITA in Ibadan on 10 June, Kenton Dashiell, Deputy Director General for Partnerships for Delivery and Alfred Dixon, Head of Partnerships Delivery Office, met with officials of the JCU. IITA and JCU discuss possible areas of collaboration. 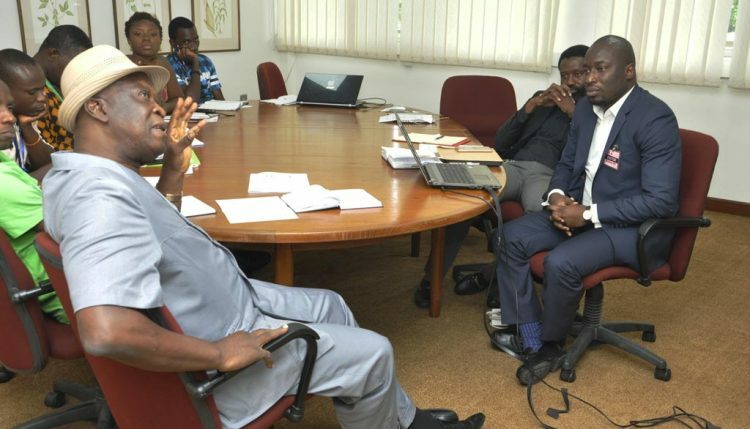 The meeting, which was a follow up to the ENABLE Youth program that was recently held in Abuja, sought to identify possible areas of collaboration between IITA and JCU using the IITA Youth Agripreneur (IYA) model as a platform and also showcase IITA-IYA enterprises and facilities. The leader of the delegation, Adefemi Adeniyi, said the JCU is a vehicle of the Nigerian Government for creating 4 million jobs. It has a mandate of creating these jobs in 4 years through five focal areas: Agriculture, Construction, ICT, Retail and Wholesale, and Renewable Energy. Three million out of the 4 million jobs are expected from Agriculture. He explained that the JCU initiative is jointly packaged by the Office of the Presidency and the Nigerian Economic Summit Group. Dixon, in his welcome remarks, emphasized his conviction that Africa can feed the world. He stated that the public-private sector collaboration is very important in the drive towards achieving job creation and tackling hunger and creating wealth. The parties potentially identified three broad areas for partnership. These include advocacy, finance, and integrating the use of information and communication technology (ICT) to create solutions such as market linkages. Adeniyi said that the JCU has developed some ICT applications and they would prefer having the IYA test-run them. He floated the idea of linking IYA to off-takers for their value-added products to the market. Both parties also discussed the proposal of aligning IYA with the School Feeding program of the Federal Government. In addition, a tour was conducted around the IITA campus with strategic stops at IYA locations. The next meeting will take place on 27 June when Adeniyi will propose a solid plan on the areas of partnership. Dashiell thanked the Government for its support to IITA and for the initiative to partner on job creation, promising that IITA would do its best to help meet the goals and aspiration of the program.